Do you ever have that problem when you decide to got out to eat, but you don't know where to go eat? Let's admit that in Chicago, there are hundreds, nay thousands of restaurants to choose from. But during that moment when someone says: where should we go.... I draw a complete blank. So we started by making a list of all the places we wanted to visit, but thanks to technology we have stepped up to a Google map. It's our food map; searchable by location or cuisine, of course. Really, this helps! And you can keep track of which places you like and which places to pass on next time. Pizzeria Via Stato is billed as a oven fired, thin crust Roman pizza. Being huge fans of thin crust, this restaurant quickly rose to the top of our list. We happened to pass by it as we were biking to Quartino to pick up a $5 bottle of wine. We had just come from playing volleyball at the beach, so we looked completely haggard. Luckily they have a great outside patio and the wa iter treated us completely fabulous...even though we probably looked homeless. This is a really big factor for Dave and I. If you can't treat nice just because we happened to be a little under-dressed one day, chances are you're going to see a greatly reduce tip or quite possibly we will leave without purchasing anything. Even though we had Sangria on the brain (which wasn't available since we were at an Italian place), our waiter choose a wonderful Barbaresco wine, perfect for a sunny afternoon. We started with an appetizer - the Fonduta. 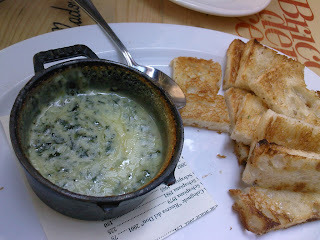 Spinach and pecorino cheese served in a cute tiny little cast iron pot with crostini ; good flavor but I have to say the crostini was more like toasted white bread. We did quite enjoy the cheesy spinach dip though and felt there could have been just slightly more served in the cute pot. Over all, the pizzas had great flavors and I did enjoy the thin crust. But there was just too much cheese on the pizza, which made the crust soggy. It's rare I see that much cheese on a high end thin crust pizza. I expect that much cheese at a place like D'agastinos. But here? And for the price of these pizza's... I want my share of toppings ... but the toppings that should have been doubled up on wasn't the cheese. 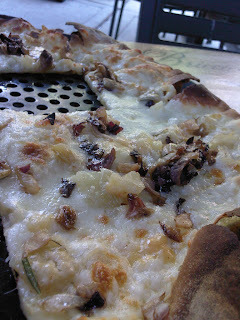 The Roasted Fennel pizza was real slim on the radicchio that was listed as one of the ingredients. 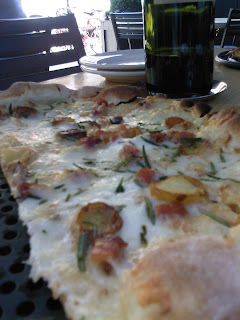 The Potato pizza, with fingerling potatoes, pancetta, smoked mozzerella and rosemary was quite good, but slim again on the toppings and too much cheese. Make a list- hand write it, hang a map on the wall with tacks or create something on the computer. What ever works for you. But keep a list so you remember which restaurant you want to visit. And when you find a good one - email me! I'd love to go! Cuz I love to be fat and happy!